Over the last year or so my son Joel and I have become hooked on The Real Ghostbusters (1986 – 1991), the long-lived Saturday morning cartoon adapted from the popular 1984 movie starring Bill Murray, Harold Ramis and Dan Aykroyd. Anyway, this adventure continues for Joel and me with The Real Ghostbusters Fire Station Headquarters (1987) from Kenner, a really great multi-story play-set from the mid-1980s. The over-sized set features a containment unit for the ghosts and a three level spinning elevator pole so the Ghostbusters can race to their car and get to any emergency. The bottom story of the firehouse is large enough to house the Ecto 1, though we have only the Kenner Haunted Highway vehicle, which is a yellow Volkswagen that transforms into a giant praying mantis. 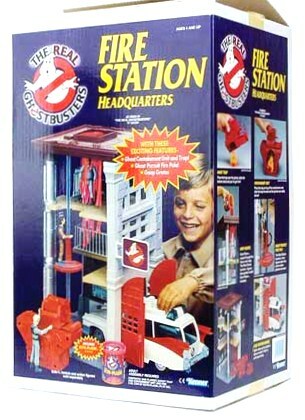 Originally, the Real Ghostbusters Fire Station Headquarters also came with some “Ecto-Plazm” slime, but since these toys are twenty-five years old, we’re missing that particular accessory. These beasts are currently in league with his other ghouls, which include a haunted toilet called “Fearsome Flush” (!) and several creepy-looking ghost “mini-traps.” There's also a skeleton monster called "Bad to the Bone." All spoken for, Joel has probably about twenty ghosts from the Kenner series, and he loves to make them launch an attack on the fire station, which the Ghostbusters (played by me…) must then defend. And by the way, I do a mean Peter Venkman impersonation (half-way between Bill Murray and Garfield…).